If you spent your younger years as an overly-imaginative child, you probably learned to perfect the classic “Turn Off The Light Switch and Take a Running Leap Into Bed So The Monster Hiding Under It Can’t Grab Your Foot!” Childhood Olympics every single night. Some of us had the misfortune of growing up across the road from a graveyard, and our bedroom was literally the first door you came across when you entered our childhood home, whilst our parents’ bedroom was way back at the end of the house. So if any monsters or zombies or other baddies of the night decided to make a nighttime visit, guess who was gonna get it first? That’s right, us! Also, our parents totally let us watch a Made-For-TV Night of The Living Dead remake, as well as the Thriller video when both premiered, despite the fact that we were only five years old and obviously not old enough to handle horrific zombie people rising up from graves to terrify the living, whether it was in television motion picture or choreographed musical form. So yeah. We had some nightmares when we were kids. But then lovable those monsters from a certain computer animation studio showed people like us that the monsters in our closets were just trying to do their jobs, and that, if we perchance got to know them, we’d find that they were basically just adorable teddy bears wrapped up in furry, funny-looking packages! It was a miracle. It changed our lives! 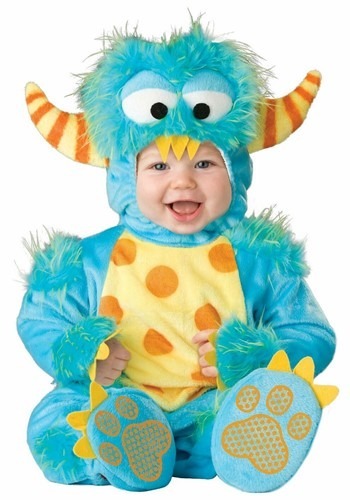 And now your little one has the chance to change the narrative and embrace monsters with this cozy and fuzzy Infant Lil Monster Costume! Zip your little monster up and we guarantee they'll be providing laughs, not screams, all night long. Well, maybe a few screams, they are a baby, after all.